Discussion in 'Shelter' started by mtwarden, Nov 7, 2018. I thought this was a really good idea for a quick, emergency shelter- winter or otherwise. I'm going to give this a go this late fall/winter. Kingsford, x39, Bobsdock and 26 others like this. That's how the rabbits and grouse do it... sort of (fire's a bit difficult for them, not having opposable thumbs). Bobsdock, rsnurkle, gnarlmaster and 7 others like this. I remember reading about this shelter type as a kid and always wanted to try it. Unfortunately for that particular desire my area has the wrong kind of forest lol. Bobsdock, mtwarden, rsnurkle and 2 others like this. Bobsdock, TrespassersWilliam, mtwarden and 4 others like this. Parking under trees is not ever recommended ,emergency or otherwise . Taking tree bows and making a shelter is one thing in an open area, but putting ones self under a tree and making fire is both dangerous for the person and the tree. So you've fallen asleep with a fire going and both burn your self and the tree up at least the rescue teams can see the smoke . If there are no tree limbs to make a shelter and there is that much snow , learn how to properly make an igloo, those work . Falling snow from trees usually breaks branches and cascades the problem on what ever is below . Seem plenty of it in my life time . Secondly in a lightening storm, trees are the usual target , I have seen lightening in a snow storm . and lots of tree strikes. If your here , preparedness is the theme , bring a tarp or a tent and appropriate clothing . If your planning to make do in an emergency for the sake of weight , that makes about as much sense as those stupid doughnut tires they put in cars for a spare. the fraction of space they might save and added weight make no sense at all . Real tires, and real tools make sense . S.Decker, Bobsdock, mtwarden and 2 others like this. So you pile up a bunch of tree branches around a bigger tree, get inside, and set it on fire? I can see how that would be warm and toasty. Maybe a bit too warm? I think I missed something. Build a man a fire and he is warm for the night. Set a man on fire and he is warm the rest of his life. Bobsdock, bosque bob, that_guy and 13 others like this. @mtwarden , I will always look if you say ‘really good idea’. Looks that way to me. A quick, comfortable shelter can be lifesaving for sure. I enjoyed reading the link. Thanks! Bobsdock, mtwarden, rsnurkle and 7 others like this. I agree. This a great idea. It seems like such common sense to me to that I would assume everyone would intuitivly try this in an emergency. The inherent dangers are worth it if keeps you from freezing to death. I've contructed shelters using trees. Nearly every boy has when growing up. It's as instinctual and universal to us as playing hide and seek and wrestling. mtwarden, gnarlmaster, NevadaBlue and 3 others like this. Definitely. Used to do this a lot as a young feller. It's a great way to get some shelter and out of the weather. Of course, common sense would need to be used if a person was to make a fire under it, but common sense should be used anytime a fire was built, yes? Oh yeah, dig the snow from around the base, may have to trim some branches, use the trimmed branches and snow as a wind break. You can have a nice snug shelter with little work. Bobsdock, mtwarden, rsnurkle and 3 others like this. In our beech/maple forests, not an option. As diseases kill the beech and maple, we should perhaps plant spruce. mtwarden, rsnurkle, NevadaBlue and 1 other person like this. Good idea if done carefully (at least, much better than no shelter). 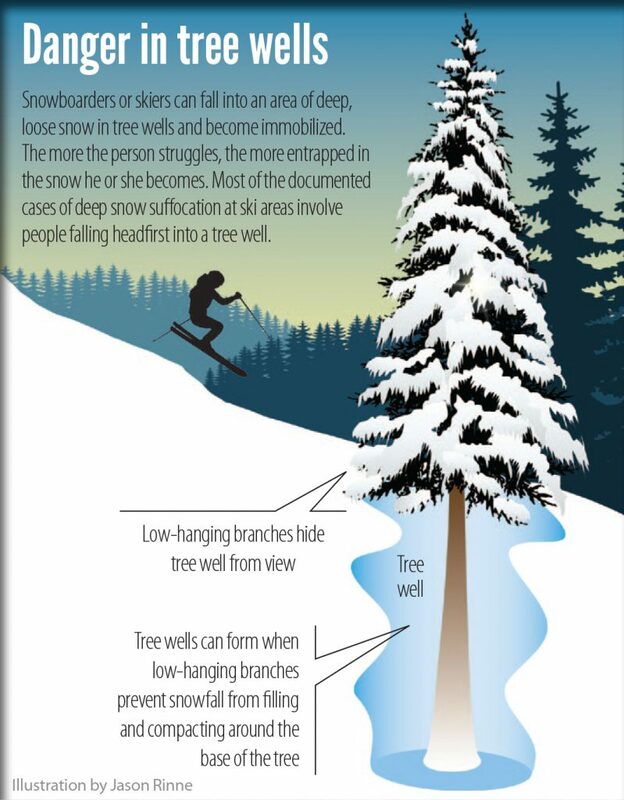 Around here people die every year falling in tree wells, usually headfirst due to aving skis on their feet. In the course of struggling to get free they knock all the snow off the tree and bury themselves. Here's a vid that makes my skin crawl, a dad and his teen in an area I ski in regularly. I went down a tree well hard while xc skiing. I was young and flexible. Today, I'm not sure I would have been able to get out. I'm not sure about a fire anywhere near a pine tree. mtwarden, rsnurkle and NevadaBlue like this. mtwarden, rsnurkle, NevadaBlue and 2 others like this. Didn`t set fire to self or three. x39, Bobsdock, hidden_lion and 11 others like this. I guess a lot of the use of this is also depending on your area. Around here, in my area, we only get three feet of snow at the most. I am sure that is safer than an area that may have ten or more feet of snow on the ground. Bobsdock, mtwarden, central joe and 5 others like this. And also much safer where the ground is frozen solid much the year, like it is here. Bobsdock, hidden_lion, mtwarden and 5 others like this. It's the most commonly used winter shelter in Maine also especially when taking a break during X-country skiing, snow sledding, ice fishing from shore and makes a nice deer blind to. Widow makers from above are moot due to small diameter limbs, length and denseness of same although you sometimes have to put up with filtered down debris, nuts and cones from the activity of squirrels/birds nested above. No record of anyone being burned up in one of these type shelters either, from my and others experience the larger the fire the quicker the snow on above branches melt or fall in clumps to partially or completely extinguish the fire but you can live with small fires and small drips anyway. Due to amount of snowfall up here wells around trunks are not an issue we consider them an added benefit. x39, Bobsdock, bosque bob and 7 others like this. Here they call it sleeping in the spruces arse, in winter, towards the spring, trees are covered in heavy snow. Spruce has braches all the way to the ground and might have several feet of snow on top. You dig a hole to the base and crawl in, make a little fire, cook and sleep like a bear. Bobsdock, hidden_lion, schapm and 6 others like this. mtwarden, rsnurkle, central joe and 2 others like this. Bobsdock, hidden_lion, schapm and 5 others like this. for some reason I slept under a tarp (couldn't have been someone forgot the tent). I just wrapped up in the tarp and two army blankets with my head in the well of a pine. crazy cold and wind chill. everyone else froze and was miserable. I slept fine. just about anything will do in a pinch. Bobsdock, NevadaBlue, mtwarden and 3 others like this. I do not have much experience with snow due to living in the south. I remember what Les Stroud said in season 4 the Norway Mountain – Part 1 and Part 2. He talked about the shelter under a tree in the snow like you see in all the manuals, or Tree-Pit Snow Shelter (see picture below). But in all his life he had never seen the snow deep enough under a tree to use as a shelter. I have seen pictures of people piling up snow around a tree to create a wind break, but when I searched for a tree-pit snow shelter this is the closest I have seen and most of the pictures are drawings. Has anyone seen this before, or is it like one website said that the snow cave is the simplest and easiest shelter to make. Bobsdock, PMSteve, MrFixIt and 3 others like this. PMSteve, MrFixIt, NevadaBlue and 1 other person like this. Bobsdock, hidden_lion, MrFixIt and 3 others like this. Even without a fire, 20min to sit and think without the wind knifing into your back, could save your life. x39, Seacapt., hidden_lion and 4 others like this. I have seen snow that deep around conifer trees. The pit makes an excellent shelter from the wind and weather, however any fire you'd make for heat and cooking, by necessity, needs to be small and constantly needs to be fed twigs and small branches. I've seen the snow this deep in Nevada and Utah. Many folks think that Nevada is one big desert. It mostly is but with average elevations in excess of 5,000 feet above sea level (ASL) easily greater than the "Mile-High City" of Denver, Colorado. Considering this, it's easy to understand why Nevada gets so much snow. Bobsdock and mtwarden like this. Thanks @PMSteve, like I said I don't have much experience with snow. If fact the last time I saw snow was in Bosnia but due to mines you didn't play in the snow. However on my trip to Alaska I did not see any snow but we did get to walk on a glacier.